I took a trip to the San Francisco area back in May. I've been meaning to write about it, so here it is. I flew there on Saturday May 2 and arrived that evening. Monday morning I went to Alcatraz first. 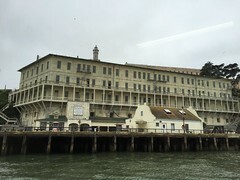 I drove to the Daly City BART station, rode the BART train to downtown San Francisco, then rode a Light Rail Streetcar to the pier and rode on a boat to Alcatraz. Visiting Alcatraz was an amazing experience! I recommend anyone visiting San Francisco take the time to visit Alcatraz and take the audio tour. Then I ate amazing fried shrimp at Bubba Gump Shrimp on Fisherman's Wharf for lunch. 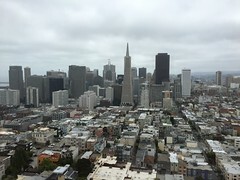 After lunch I went to Coit Tower to see a great view of the city. I visited the Cable Car Museum. It's neat, but there's not a lot there. Then I rode a cable car to the end of the line and watched them turn it around (click here for video). Tuesday I visited TWiT Brick House Studios in Petaluma. I toured the studios, watched Tech News Today, MacBreak Weekly and Security Now (tech shows) in person and met Leo Laporte and Mike Elgan. Thanks to Leo and the TWiT gang for allowing me to visit the studios and continuing to create great tech shows! 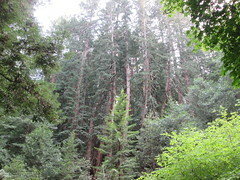 After visiting TWiT, I went to Muir Woods, a redwood forest just north of San Francisco. It was so beautiful. The drive to get there is just as beautiful on winding roads. Next I stopped near Spencer Battery where there is a great view of the Golden Gate Bridge. Then I went to Twin Peaks to see another view of the city. Wednesday I spent time in Silicon Valley. First I visited the Intel Museum. It is free and kind of neat, but there isn't very much to it. Then I went to the Computer History Museum, which was amazing! 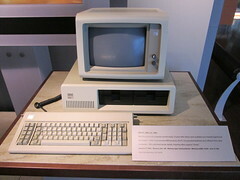 Everyone interested in computers should definitely visit the Computer History Museum! After that I drove by Google's headquarters and went to On The Border for amazing tacos. Later that afternoon I stopped by Apple in Cupertino and got a shirt with the Apple logo. Then I found another Fry's Electronics store in Palo Alto (see pictures at the bottom). Thursday I had amazing beignets for breakfast at Brenda's French Soul Food. Then I went to the Aquarium of the Bay. The aquarium was neat, but it wasn't very big. I spent some time at Fisherman's Wharf and ate fish for lunch at a local restaurant there. Later I went to the Ghirardelli Square Soda Fountain and had a Warm Brownie Sundae. Then I walked to crooked Lombard Street. Friday morning I went back to the airport to fly back to Columbus.